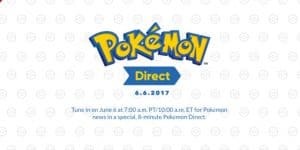 Pokémon Direct June 6 | Nerd Much? Nintendo has sent out the news, there will be an 8 minute Pokémon Direct tomorrow June 6 at 7am PT. Nothing more was said, so we’ve got very little to go on here. However it is only 8 minutes long, implying a trailer and some explanation. It will likely have to do with the Nintendo Switch, which means we’ll be getting a Pokémon game for the console, and we’ll finally get to see what Pokémon Star is all about. Or, they are announcing the already leaked Fire and Ice event for Pokémon Go, though none of the previous events for the game have been mentioned in a Direct. Mainly because it is Niantic that is taking care of that game, not Nintendo. As such, it’s hardly worth mentioning but it is good to keep a grain of salt on hand. I was hoping Nintendo would save Pokémon Star for E3, but it seems the company is bound and determined to pretend E3 isn’t a big deal. No need for major marketing campaigns in the month of June, just Treehouse and watching somebody play ARMS for an hour. Well, I hope it isn’t just that, but I fear it. Having a Direct days before the event doesn’t bode well, unfortunately. What do you hope to see at this Pokémon Direct? Let us know in the comments below!